View of the Medecins Sans Frontieres (MSF) field trauma clinic with an emergency room, operating theater, intensive care unit and in patient department. 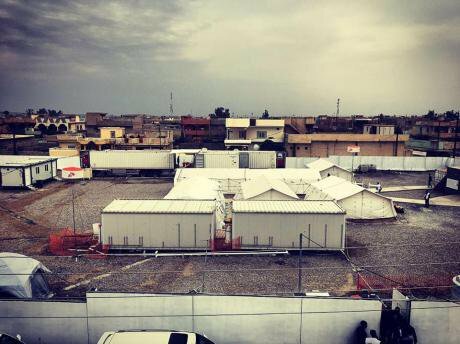 The facility was opened on the 16th February in a village south of Mosul. For more than one month it has been the closest surgical facility to West Mosul. Picture taken on 02 April, 2017 by MSF/Alice Martins. Used with permission.Not long ago, I was dispatched by the medical humanitarian organization Médecins Sans Frontières (MSF) to an MSF-run field trauma hospital in Hammam al-Alil, which, for a brief while, was the closest surgical facility to West Mosul. The trauma hospital is an exceptional project. About two months into its opening, 2067 patients have been received at the hospital; 55 percent of them were women and children and 82 percent had war wounds. To date, more than 160 major surgeries were performed by Iraqi and international staff at the facility. These facts alone should remind us that the massive cost of war – particularly in counter-terrorism conflicts where both sides tend towards a ‘total war’ approach – is often paid by people, young or old, caught in the crossfire, mortars, and airstrikes. There is something astonishing about human beings, especially those who have suffered for so long due to a variety of reasons. They continue to exist, to persevere, to work and live, often defiantly so in the face of humanity’s greatest acts of brutality. They – like other communities in West Asia and beyond – deserve the absolute best yet have received nothing of that sort. That must change, don’t you think? I am in my mid-twenties and I work as a driver for MSF at the trauma center. Emotionally we are affected by the situation because our community and our people are facing injustices. Many groups have played around with us and this has destroyed us. I have not seen one moment’s respite in this country. Not even once. Currently, outside of work there is no safety or security. There are no guarantees. You sleep at home and you don’t know who will come for you. The country isn’t functioning. You don’t know when or where something bad will happen. Your mind is exhausted from constantly thinking. Now, there is no stability. All we have now is aid for food and gas. Other than that, there aren’t a lot of services for people. I do not have hope for the future. Not one bit. You don’t have this personal security to wake up in the morning and really think far about the future. Since I was born in the early 1990s, I have not seen one moment’s respite in this country. Not even once. I can’t even think of a future within Iraq. There doesn’t seem to be a future for my generation. You can’t continue your education, you can’t find suitable work. So there is a lack of many things that can make you comfortable with your life. At almost 37 years old, I am not young anymore, life has made me age so much. Today, my son and my husband are injured. I have six children – three sons and three daughters. This child [being treated], is Mahmoud. He’s eleven years old. I was sitting at home. All of a sudden I heard an explosion. It was the largest blast I’ve ever heard. I ran out of the house to see my children who were outside. Three of my children ran towards me. I saw the injured on the ground, and blood. I don’t know how to deal with this. I saw my husband injured. I ran to my daughter’s house and cousin’s house to get help. I told them what happened and we ran back. One of my relatives went to the Iraqi army to get help too, while other relatives of ours had come running from the Nablus district. Iraqi soldiers came and took my husband to get treated in some other hospital. At the moment I don’t know his situation – one moment they tell me he’s dead, another that he is alive. When I returned home in the evening I found out my child [Mahmoud] was also hurt, his nose was ripped apart. I hadn’t known at all. There was blood everywhere. I left my one year old at home and he is being taken care of by his uncle and other members of my family at the moment. I hope he’s okay and they are feeding him milk and biscuits. I have three children in refugee camps. Maybe it was better to have just stayed in the camps. I don’t know. They are calling me, crying and asking about how their father and brother are. There is supposed to be a second surgery for my husband. I don’t know what is next really. Life was becoming normal. Then came this mortar. Before this tragedy, my husband was unemployed. There was no work. He was also sick. He has high blood pressure and I’m always worried about him. He was born in 1958. Hopefully he’ll be okay and come back home. Hopefully we can all be back home together. Our neighborhood was supposed to be safe after being freed from ISIS. We’ve been freed for over a month and had hoped to restart our lives. I don’t know where this mortar came from. The frontline is far away. But what is written is written. Life before being freed from ISIS was hard. Everything was controlled. We didn’t have soup or bread. It was a difficult life. But life was slowly returning after. Very slowly. Food and aid were coming in. My children are used to eating little, so even when we finally got food in, like bread or biscuits, my children would only eat half of it. Life was becoming normal. Then came this mortar. God protect us. I hope my children start eating more. I have barely any hope. God is kind. We have survived a lot of evils. God saved us from injustice. My son is sad. He says his nose is gone, I told him it is okay there is nothing to be done. We will try to live and continue. God is kind. My name is Mohammed Khalid Taha. I am 38 years old and I work as an assistant surgeon in the operation room here in the trauma center. The work here is really beautiful. I describe it as beautiful because the people I work with are intelligent, respectable, and treat me as an equal. While I work here, I also work in another government hospital in Al-Salmaniyeh. When I’m off from work, I come straight here to assist in surgeries. We do see horrible things, but what helps is that when you save patients it eases your soul. There is hope in that. A lot of the patients that we treat have different types of wounds. It ranges from amputations to complicated forms of surgeries. Those we can help come to our operating theater, while others are referred to other hospitals. There was a period in which we had to do a lot of surgeries. You have to save people as quickly as you can in order to move to the next case. You cannot hesitate or be slow because the life of the patient could be at risk. The most important thing is to save them. Overall, a lot of the cases are very depressing, they’re miserable cases. At my day job [in the government hospital], we mainly treat injuries related to accidents and after a number of years working in such an environment, you get used to the work. But here, you see different types of injuries in different age groups. The youngest patient I worked on was a seven year old, while the eldest was around 60. It’ll affect you. You will hold yourself together, yet inside you will still be affected. Many of the cases I have dealt with are related to suspected sniper fire or IEDs on the road. So thankfully the team here is exceptional and cooperative. We are learning a lot from the modes of work. And I do think the various humanitarian groups working in Iraq are helping, including MSF, and they are doing it right. We do see horrible things, but what helps is that when you save patients it eases your soul. There is hope in that. I am 28 years old but the situation we’re facing makes me feel like I am 100. I started working in the trauma center when it opened. I am a cleaner for the emergency room. I clean before the injured come in, and especially when they are taken away. The work is good. You see hard situations but I am used to this because I worked as a cleaner in other hospitals before. So blood or no blood, I have seen it all. Yet, I still get up in the morning and I still come to work. I have lived in this area my whole life. I never went anywhere. Before ISIS, it was a good and decent life. When ISIS came, and the siege was placed, we had no work. We had no money to buy clothes and had to rely on our savings and whatever we had at home. Then we were liberated and ISIS was gone, and now I work with MSF, so life is better. Till now I wouldn’t say I’ve been through many difficulties in my work but yes, we are still bothered by the fact that our community, our families are hurt. Truthfully, the country isn’t secure and the future seems unstable. So internally we aren’t in comfort. I don’t have much hope for the future. If these organizations leave, and our work is over, we don’t have much left. There is barely anything left. Yet, I still get up in the morning and I still come to work. My name is Ridwan Jalal Mohammed and I am almost 50 years old. I am a doctor and a surgeon in this trauma center. I started working with MSF about a month ago. Before here, I was a surgeon in Mosul living in the neighborhood of Al-Sadiq. Life over there continues; not with ease, but it does go on. Working with MSF at the trauma center seems easier than what I did because of the types of treatment I can offer to the patients. The quality of care here is really good. Most of the cases I’ve dealt with relate to mortars. A mortar is an explosive device that releases shrapnel that then hits different parts of the body, in goes into the muscles and bones. Here our patients widely differ in age; mothers, fathers, the elderly and children. They are all different. Life over there continues; not with ease, but it does go on. The hardest thing to witness is family members losing loved ones. Yesterday, for example, we had a father who lost his daughter. It was very hard to see this. It is hard for a father to lose his child. This trauma center is an archive of pain. A doctor sees a lot of things in his life, but he must continue to do his work because mercy is powerful. To treat a patient is a blessing and we do what we can as human beings but the rest is in God’s hands. The best thing is to have patients fully treated; to receive the patient, to treat them, and then to see them and their family happy to be alive. There is no doubt I have hope for the future. I always hope that life will be better. A human being must do their part for those around them. My wife’s name is Widad and we’ve been married for seven years. We have only one child who is six months old. Her name is Hadeel. It’s a beautiful name, don’t you think? We lived in the IS controlled district of Yarmouk in Mosul where life was indescribable. There was hunger, fear and terror. ISIS would kidnap people and whatever form of torture you can think of, they did. There were airstrikes on our area and there was shelling. It was death all around. If we didn’t leave we would have died at home. Her name is Hadeel. It’s a beautiful name don’t you think? My lovely wife, during all the fighting and strikes, would sew things for our child. She would make gloves, scarves, pajamas. Seven years and this is our first child. It was tough for us to conceive a child but we were granted Hadeel. We decided to leave last night (March 30) at one in the morning with a bunch of people. We were a huge family leaving by foot. They [ISIS] saw us – they were stationed on one of the roof tops – and then I think they triggered an improvised explosive device. My wife lost her leg. Four children were taken to Erbil for treatment; I think one of them has died. I don’t know. I don’t know about the others who were with us. We were brought to a medical point where they stopped my wife from bleeding to death. Then they referred us here [MSF Trauma center]. They welcomed us. It was a good reception. Yes they are foreigners, and they came from far away, but they are better than any other humans I’ve known. All I’ve seen was slaughter and death. But here [in the MSF trauma center], there is a sense of safety. They take care of the sick and injured. They took care of my wife. They treated her but she has no leg. She has no leg and I think this will hurt us in the future. I know this is God’s will, but I don’t understand why this happened. This shouldn’t have happened. I do have hope for the future. I do have hope. Life will return to normal. We will forget this horror. As long as we have hope we can live, without hope, life is over. I just hope tomorrow my wife can be better, that she can get up, walk, and play with her daughter. I have hope. God takes things and gives things. I will be by her side and help her, inshallah (God willing). My name is Saleh Mahmoud Mohammed. I am 31 years old. I am a watchman for this trauma center and started working just as the trauma centre opened. Before working here I didn’t have any work. The situation in my area, in Mosul, was very challenging; you had to beg for any work. After liberation, which was a happy moment, it was still hard because work was scarce. When MSF came, they really invigorated the area. We actually thought they would be like other organizations, as in they wouldn’t really benefit us or give us good quality care. MSF immediately provided jobs for the people who were unemployed; it has really transformed the area and the lives of many families. When we cry, they cry. I am the first person who sees the cases from Mosul when they arrive and I’ve seen absolutely miserable cases of all types, and in turn the doctors have tackled these cases with many treatments. As human beings, we are facing circumstances that are extraordinary, and this causes a sense of mercy. When you see a child, or a woman, or a man who are hurt, it causes you pain. But when you see the doctors here – Iraqi or foreign – doing all they can, you do so too. When we cry, they cry. The country is going through a difficult time. It is miserable. One story that is happy is the time when there was a patient – a woman – who we all thought was dead. We were around her to say goodbye, and then, even with all the science against her, she lived! It shocks you in a good way. At the same time there was a case who had only minimal wounds but died because of a heart attack. It was apparently in the same day. What is written is written. I have huge hope for Iraq. The most important thing is that Iraq remains united, that after this war, we return as one people. My name is Hassan Mahmoud Ahmad and I was born in 1968. My daughter’s name is Ilham and she is ten years old. I have eight daughters in total. I’m always worried about them. Every one of them. My daughter was injured on the first day we arrived to a “safe” area. We were displaced from an area of Taktak and arrived to a house in a new area. Before we were displaced, it was a dire situation. It was just abuse and death for people. My daughter was injured on the first day we arrived to a “safe” area. It happened as my relatives went to clean a house. It seems there was a booby trap or some unexploded mine or something. All I know is that she crumpled to the ground and started bleeding. God save us all. There isn’t much more to say about the circumstances. All we’ve seen is displacement and refugees. What more can one say. All I want is peace of mind.